Here you'll learn about me and my paintball habit. I am addicted to this sport. It is such a rush to play this game. It ROCKS! 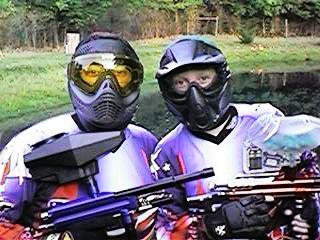 Here is picture of me and my favorite paintball player, my son, Mikey. A friend of mine said we look like stormtroopers from the Star Wars movie. Feel free to browse my site and check out the cool photos. I can also build you a pvc paintball gun stand for your team. They can be built to accomodate 1 to 10 guns. They fold for easy storage. Check out the "my guns" page to see one.